When Ruth Handler and Mattel introduced Barbie in 1959 it created quite a sensation! 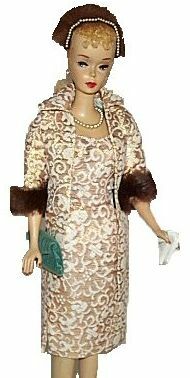 She was inspired by Ruth's daughter Barbie (of course), as an alternative to their weekly shopping for paper dolls. I was born the same year as Barbie and she was a very important part of my childhood. When my own daughter started playing with Barbie, I fell in love with her beauty and elegance. Shortly after that, I rediscovered the precious few pieces that survived my childhood and I began collecting vintage Barbies. (The coat and purse pictured on the left are from my original childhood collection.) Vintage Barbie dolls and clothing are beloved by collectors for their quality and representation of the clothing of the era. As styles have changed, so has Barbie. Of course there have been many others and as little girls who played with Barbie have grown up, an entire industry of collectible dolls has been developed for those of us who still like to play with our dolls! My goal is to provide a comprehensive resource to vintage Barbie dolls, clothing, accessories and other collectible fashion dolls, beginning with Barbie's debut in 1959. The main focus of this is vintage Barbie and her friends and family. I will also be adding in other vintage dolls and today's dolls as well. I hope you will stop back often and please send me your comments and suggestions.